Google has an Android event planned for Oct. 29. 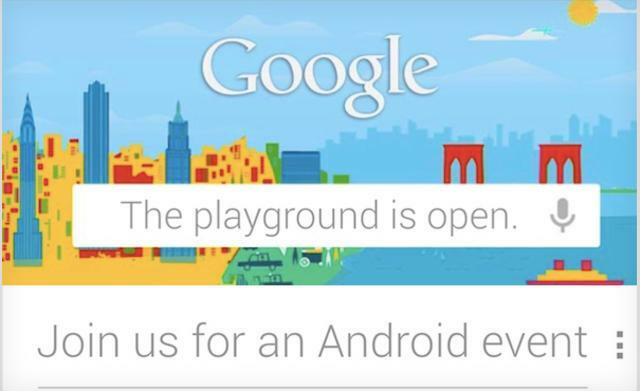 Invites have begun to flood inboxes around the Web, with a tagline that says, "The playground is open." What does it mean? October has been full of rumors of Android 4.2, which will likely be the star of the Monday event. One report in particular, from a few weeks back, suggested that the next upgrade will focus heavily on customizing the user experience, with an emphasis on a better Google Now and an all new Customization Center. Additionally, 4.2 will reportedly introduce Project Roadrunner, which is designed to make Android's rap for chugging battery a thing of the past. It'll be an interesting event, to be sure, one that'll happen a week and a half after Apple is set to introduce its iPad mini. And even though Google's event will be focused on Android, it might be a good opportunity for the search giant to finally let the 32GB Nexus 7 out of the bag. It's not like we don't know it's coming. Furthermore: Come on, Google, give us new Nexus devices. LG seems to be the frontrunner for the next wave of Nexus-branded handsets, with rumors of a Sony-made device coming as well. No Samsung, HTC or even Motorola? We'll find out. It's likely we'll see a full squad of vanilla Android handsets at the event — running Android 4.2 no less — which would give Google plenty of ammo to knock out the iPhone 5 this holiday season.